Santa Margarita Fishing Map and Fishing Report and fishing information, Where to Fish and how to fish this lake for bass, trout, crappie, catfish and stripped bass- also hunting clubs, private fishing, hunting ranches in california for fishing and california hunting. Santa Margarita spawn is on ,shallows are thus holding bass. Use Spinners and buzz baite as reaction baits are what they strike. Ramp is congested and highwater is making things tricky. Happy problem. Crappie bite is good just find some brushpiles using jigs ona bobber, plenty of bluegill too. Location: Santa Margarita Lake is located just north-east of San Luis Obispo in San Luis Obispo County. From San Francisco, take Highway 101 south and turn left at Santa Margarita. Species: Largemouth bass, striped bass, channel catfish, crappie, bluegill, Fishing hours: Summer hours are 6 a.m. to 8 p.m. There is no night fishing allowed. 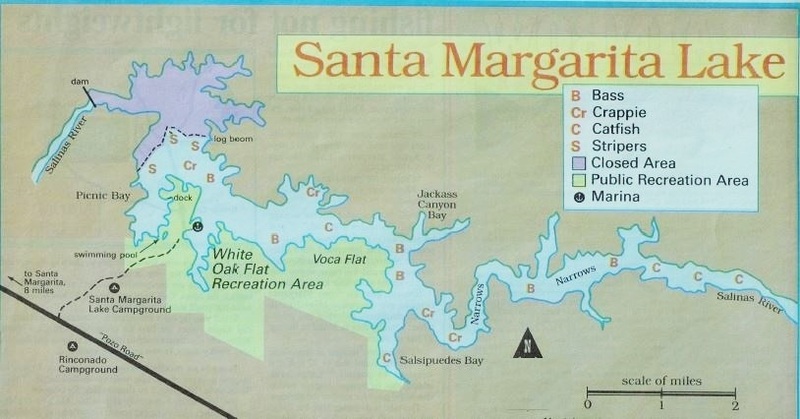 Boating: Santa Margarita is a drinking water lake and no water skiing or swimming is allowed. Camping: Santa Margarita Lake Campground is located two blocks outside the gate. There are approximately 200 sites, and about half have complete hook-ups for electrical, sewer and water. There is also a swimming pool, bathhouses, video room, laundry, store, small playground and hiking trails. Santa Margarita Lake in San Luis Obispo County where water skiers are forbidden and fish are plentiful! Solid sport for striped bass, largemouth, crappie, channel catfish and bluegill. All kinds of ﬁsh are chasing shad in the coves, and anglers who throw shad-imitation baits like Rapalas should connect with the fish. The Lake has only come up one foot this winter, but still there is opportunities for a decent outing. Catfish seem to be all over the lake, and a lot of people are catching them from the bank, live or fresh dead shad is the best bait on the catfish, channel cats are also chewing up mackerel and chicken livers. Stripers are starting to impact the action too, with some good 6 to 10-pounders hitting hooked shad. Crappie ﬁshing is also productive. The recent warm weather has brought shad up shallow, and gameﬁsh are busy feeding on them. Big stripers are looming just under the surface, and crappie and catfish are in shallow water lunching on forage fish. Early Summer is probably the best time of the year to be on the lake for these species. Bass ﬁshermen who use boats will have the best success as the weeds in along the shoreline make it tough to bank fish. lt can be done. though. Santa Margarita bass are of northern-strain. so don't expect them to run the size of their Florida-strain cousins found in some nearby lakes. Most will run 12 to 15 inches, making Santa Margarita an excellent place to splitshot or use other techniques designed specifically for light tackle fishing. Pig-n-jigs, crankbaits and spinnerbaits are all working for the bass. Our source4s recommend light-colored cranks. Bassers will find most of the fish in the top 10 feet. There is some submerged brush at Santa Margarita. And you’re going to ﬁnd the bass concentrated around rocky structure. which is plentiful. The best way to work this kind of structure is to systematically fish the rocky points. Set your bass boat outside the coves and pitch worms or crankbaits into the bank. Bass are most active now in the mornings and evenings, and that‘s a signal that topwater ﬁshing should be good at dawn and dusk. Santa Margarita has traditionally been a topwater lake, and the best areas are usually Swimming Pool Cove, the cove by the marina, Vaca Flat and the upper end, but hot spots change, so check at the marina before you go. Surface plugs that gel a lot of play are Zara Spooks, Lunker Buzzes, Devil's Horses and Rapalas. During midday hours, plastic worms are a solid bet, especially in black, brown and purple, on leadheads. The bass and other species coming out of Santa Margarita arc “fat, clean and healthy looking," the marina source said. Striper ﬁshermen are wrestling fish that average 8 and 9 pounds, but a few in up to 15 pounds. The biggest share of the boils have been down at the log boom. They’ll boil for 5 or I0 minutes at a time. Sometimes you can throw anything out there and they’ll take it_ nd sometimes they don‘t want to hit anything. Not surprisingly, live shad's the best bait for the stripers. But linesides can also be fooled by imitators like large rainbow colored Zara Spooks and Shad Raps. A 17 pounder came in recently, but most of the catﬁsh average about 2 to 3 pounds The majority are channel cats. Your best bet for bait is to net shad and ﬂy-line it, but cut mackerel or anchovies will work too. Consider ﬁshing fairly heavy line with lighter leaders, as a lot of these eats will top 10 pounds. Catﬁshing is best from a boat, but bank anglers do get their ﬁsh, especially near the swimming pool. And there is about seven miles of shoreline you can explore by foot. One excellent area for bank fishing is off the ﬂoats near White Oak. Take the road down the south side of the lake and the dirt road that cuts off from there and look for the ﬂoats. Hit the lake early and late for the best action. Panﬁsh are also plentiful at Santa Crappie are thick throughout the lake, and there are scads of bluegill to keep the kids happy. Bluegills re thick in all the weedy areas of the lake. Take along some Micro Jigs or 3/64- ounce Mini-Jigs, and tip them with a piece of mealworm for the bluegill. The easiest way to fish jigs and worms is about 3 feet under a bobber. My name is Bill Leon aka "Gunner". 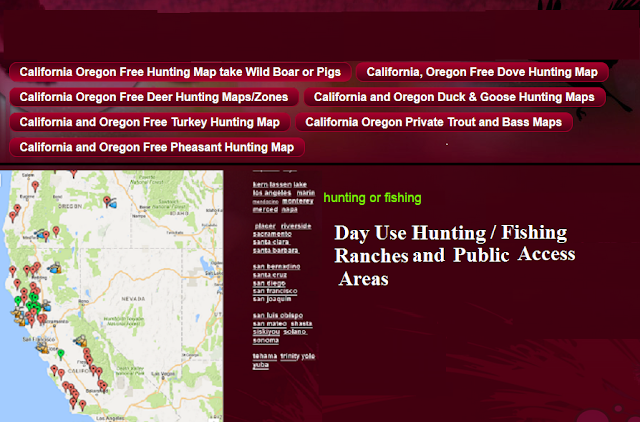 I am a licensed hunting and fishing guide certified with the California Department of Fish and Wildlife at https://www.wildlife.ca.gov/and enjoy sharing the latest information where to hunt or fish in California and Oregon. I personally call or contact such highly skilled guiding companies and people in this industry as Tom Oliveira Fishing, Dicks Fishing Charters, Dinkey Creek Inn, Rancheria Marina or Steve Santoro Fish Box Charters I use information from lots of expert sources such as Tom Stienstra at https://tomstienstra.com Or I go on the road and report what is happening! My name is Bill Leon aka "Gunner". I am a licensed hunting and fishing guide certified with the California Department of Fish and Wildlife at https://www.wildlife.ca.gov/and enjoy sharing the latest information where to hunt or fish in California and Oregon. I personally call or contact such highly skilled guiding companies and people in this industry as Tom Oliveira Fishing, Dicks Fishing Charters, Dinkey Creek Inn, Rancheria Marina or Steve Santoro Fish Box Charters I use information from lots of expert sources such as Tom Stienstra at https://tomstienstra.com Or I go on the road and report what is happening!